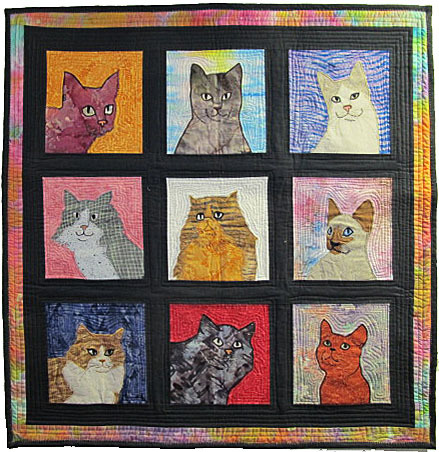 Fifteen different cat faces in 7 1/2" blocks. This pattern includes gold lamé for the eyes. 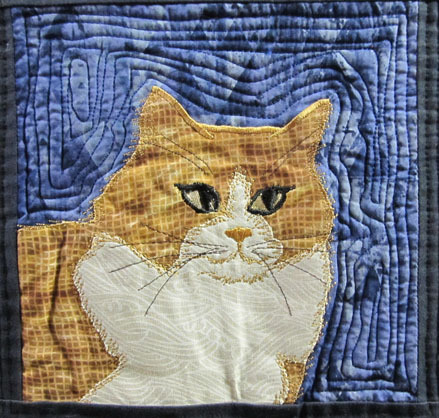 This pattern gives you instructions for drawing the cats' fur in straight stitching. That is the beginnings of thread painting. The ears and eyes are satin stitched. The quilt in this photo is 32" x 48". This is a different quilt from the one on the pattern cover. It is for sale for $225.00...that is $25 a cat and you don't have to clean up after them or take them to the vet! 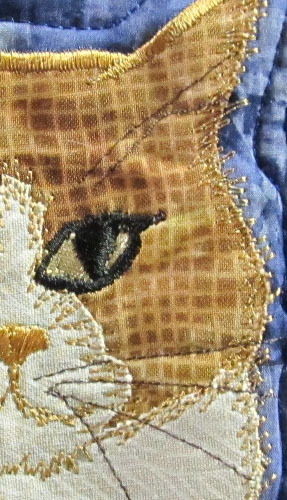 This is a closeup of one of the cat faces. Click on the thumbnail to see it larger. This shows the straight stitching to indicate fur and satin stitching for the ears and eyes which are smooth.